at either the Casper website or Target. If you want to try it before you buy it, you will be able to find a display section in Target. What I found really interesting was that the prices at Target were way lower than the prices on Casper’s website. 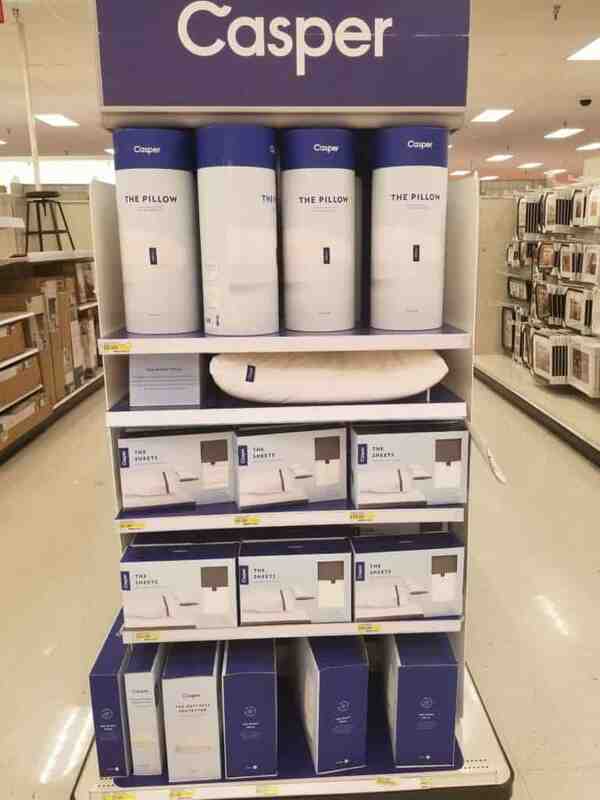 I don’t know why, but I’m guessing it gives Casper a bit more of a sales angle if they throw in a pillow with a mattress purchase. Saying I’ll throw in a $95 pillow makes the deal sound better than I throw in a $65 pillow right? I had another thought, and that’s just that Target knows their audience and the competition, so they feel that they can sell the queen size pillow at $55, King at $65 and the new nap pillow for just $35. The other thing that I discovered was how much I like having an oversized (King) pillow for my queen bed. I use it in the same way that you would use a body pillow, I guess it helps that I’m petite. you can feel the pillow before buying it. I picked mine up for $55, but I’m going to return it soon. I’ll explain why in a bit. I was shooting a video to purchase the new Casper Essential and after I bought it I unboxed my Casper pillow. I have forwarded the video to the unboxing part below. 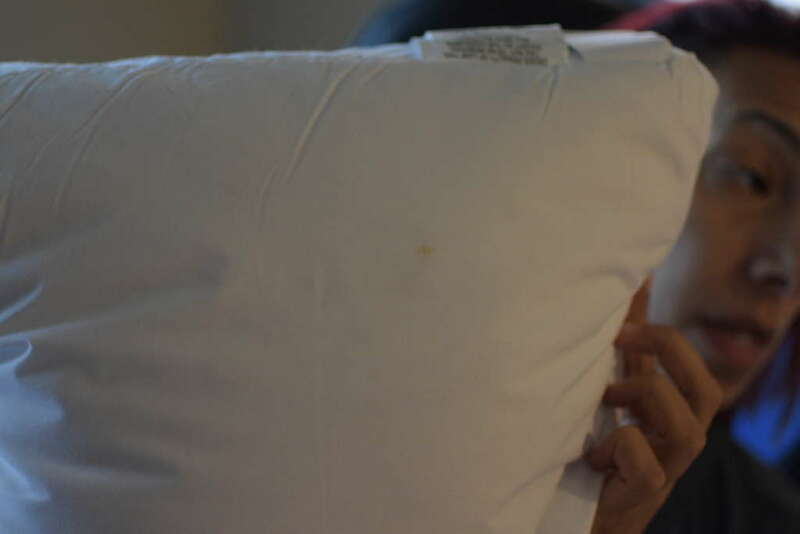 Right around the 5 minute mark you can see a stain on the pillow, it’s not huge, but IT JUST CAME OUT OF THE PACKAGE! Seriously, that’s just unacceptable. I contacted Casper and they told me to take it back to Target. So I’m going to do that get my refund and then use that $55 to buy another Casper Pillow as a prize for this week’s giveaway contest. When you unzip it you will notice how plush the cover is. The cover that I have is different from the picture shown in the Tandem Goods LLC vs. Casper lawsuit. Tandem vs Casper (which was settled in January 2018). I wonder if they have produced different versions over the years or if Target licenses a slightly different product for their shelves. I know that the spot isn’t huge, so I guess I’m a bit picky. I just expected better out of a large company like Casper. As to the feel of the pillow, I did try it out, and I really liked it. I currently have more pillows than I can use, but I like this enough that I may just exchange it for another one rather than a refund. 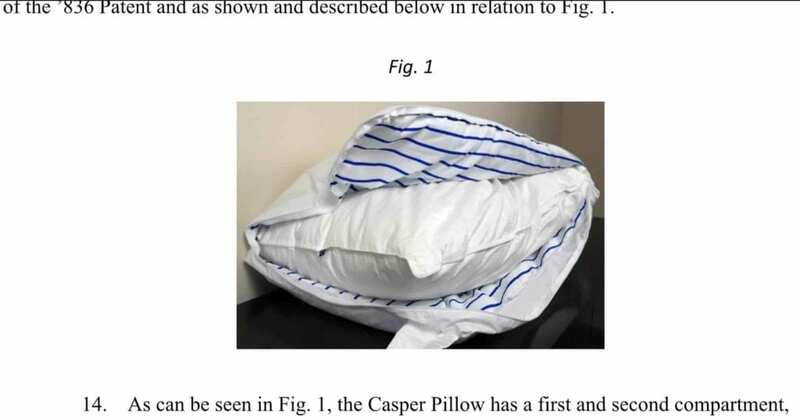 The pillow is machine washable and weighs about 3.5 pounds. Here is where the magic happens. I didn’t really appreciate it until I unzipped it and folded it down. Inside you get this 100% cotton feel that made me ask if the cover was reversible. It’s not, but I think you get the idea of how much I like it. The cover is made in China but filled in the USA. As I have discussed before Casper is a global organization so that’s expected. The inside is a polyester fiber material, that feels really light. It gives you enough support to keep your head up and I find that when I’m watching TV in bed this pillow does the job of 2 of the lower profile ones I have. I’m a big fan of plush pillows, I like having my head lofted up a bit and the Casper totally fulfills that desire. As I throw around different pillows at night trying to decide which one I’m going to use the Casper one rises to the top as it helps you watch TV by having just the one Casper vs. 2 of the lower profile pillows. I highly recommend the Casper pillow to anyone who likes a soft/high profile pillow. It comes with a 100 night trial so I encourage you to give it a shot.